Last year’s homecoming parade in Rochdale by The First Battalion of the Royal Regiment of Fusiliers is now available to watch online. 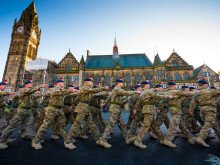 Rochdale Borough Council commissioned a short film to commemorate the parade held last November which saw thousands line the streets as the town centre was brought to a standstill to welcome home hundreds of soldiers returning from serving in Afghanistan. The Rochdale community came out in force to welcome home hundreds of soldiers who have returned from serving in Afghanistan.